Noise is a persistent issue on urban rail transit systems. Vehicle and track design, wheel and rail conditions, the age and design of the infrastructure may all play a role in how noise and vibration radiate and how they are perceived by the public. When it comes to dealing with train-generated noise (and vibration), rail transit systems differ significantly from freight railroads. Rail transit systems carry thousands—in some cities, tens of thousands—of passengers on the system per day. Every one of these riders gets a daily dose of exposure to the noise generated on the system. Add to that the residents, often in densely populated urban areas in proximity to the line, who bear the auditory brunt of every train that passes during every waking (and non-waking) hour of every day. For them, transit noise becomes a “quality of life” issue. In the transit arena, every passenger or resident represents a potential vote on bond measures that affect monies and maintenance activities on the system. On top of that, every one of those riders and residents is a phone call away from City Hall, the offices of the transit agency, or in some cases an agency’s board member to register a complaint about excessive noise and a demand that something be done about it. It’s no wonder then that noise- (and to some extent, vibration-) related issues have the ear of transit management. To the rider or resident, noise is noise; vibration is vibration. To the transit or acoustics professional, they are nuanced engineering, maintenance, acoustic and political problems. The causes—and cures—are numerous and varied; the challenges, formidable. While noise and vibration are often considered together, they are typically addressed in different ways, and at different times. Vibration is typically addressed during the design phase. Measures to reduce vibration can be much more expensive than measures to mitigate noise. “There have been situations where the cost for the required vibration mitigation affected the feasibility of the project,” said Hugh Saurenman, president of ATS Consulting. Noise is typically addressed after trains begin operating. There are situations in which ground-borne vibration is an issue, but those are rare, said Bill Moorhead, Principal of TRAMMCO, LLC. Typically, airborne vibration, noise—often a result of corrugation—is the primary culprit. Depending on the severity, there can be up to 20 dBA difference between smooth and corrugated rail. The Federal Transit Administration has developed guidelines for assessing and developing remedial actions for N&V. Individual transit systems have also introduced innovative approaches to identifying and mitigating noise, in particular, at the source. —Briony Croft, Acoustics, SLR Consulting (Canada) Ltd. There are multiple types of transit noise. Switch impact noise, noise radiated from the guideway structure, in-car noise, curve noise, squeal, flanging noise, traction noise and wheel/rail rolling noise, for example. 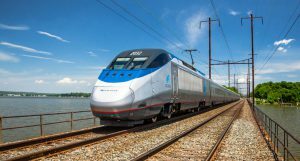 “Any system that has a steel wheel and a steel rail will have rolling noise,” Briony Croft, principal engineer at Acoustics, SLR Consulting (Canada) Ltd., told members of the American Public Transportation Association (APTA) Track and Noise & Vibration Technical Forum earlier this year. While related, each type of railway noise has its own source and migration path. “To understand how to mitigate noise, you have to understand the root causes,” Croft said. There is no one-size-fits-all solution to address them, but reducing wheel/roughness will always provide the biggest bang for the buck. From an acoustics perspective, there are three options for noise mitigation: mitigation at the source (i.e., the wheel/rail interface); mitigation at the propagation path, which often requires the use of noise barriers, which on transit systems is typically not an effective or feasible solution; mitigation at the receiver (a residence, for example), which is not within the control of the transit system. In most cases, transit agencies focus maintenance efforts on addressing rolling noise at the source—the wheel/rail interface. Along with wheel and rail roughness, track components have an effect on noise. Slab track, for example, is typically noisier than ballasted track; softer rail pads are noisier than stiffer rail pads. And while soft fasteners (140 kips/in. 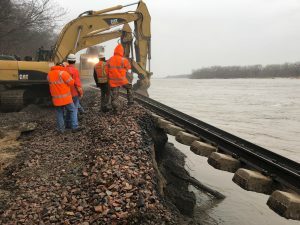 or less) may be adequate in tangent track, they allow the rail to roll and gauge to widen in curves, which can exacerbate noise-related issues, Bill Moorhead said. Wheel shape and size is also a factor. Smaller wheels tend to be quieter than larger wheels. Speed, of course, is always a factor. 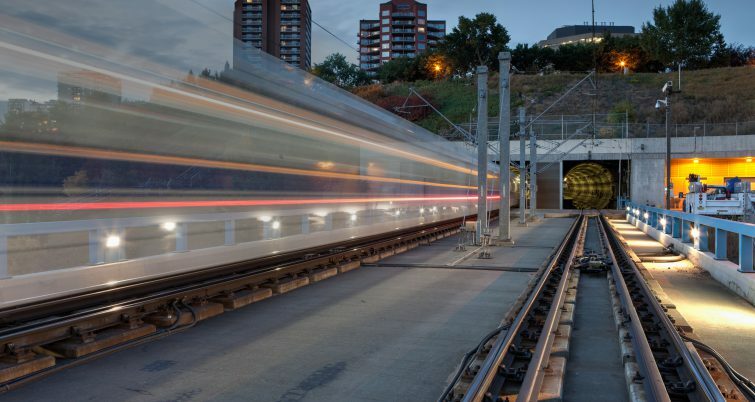 While not commonly used in North America, rail dampers are used in Europe to mitigate noise that is radiated from the rail. 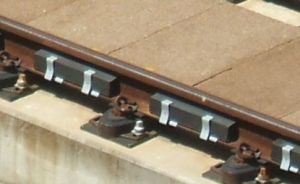 These types of damping systems are typically attached to the rail between the existing fasteners to reduce the length of rail that vibrates under a train, thereby reducing the rail’s contribution to overall noise. 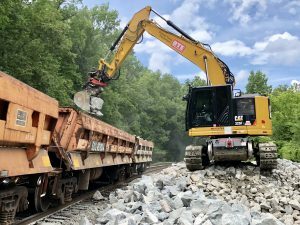 Rail dampers are most effective in slab track and applications with soft rail pads or baseplate fasteners, on systems with relatively small wheels in which rolling noise is the dominant issue, Croft said. They are least effective in embedded track and applications with stiff rail pads, in addressing squeal and flanging noise, and on systems with larger, noisy wheel shapes. “Rail dampers have no effect wherever wheel noise is the dominant noise source,” she said. Some systems, again, primarily in Europe, mount custom dampers to the wheel to reduce wheel-generated noise. Rail dampers typically attach to the rail between the existing fasteners to reduce the length of rail that vibrates under a train, thereby reducing the rail’s contribution to overall noise. In North America, where corrugation is the dominant cause of rolling noise, transit systems rely on the use of premium rail steels, better matched wheel/rail profile designs, lubrication / top-of-rail friction management, which is used to reduce wheel squeal and slow the onset of corrugation, and, ultimately, rail grinding (or milling), the standard remedial approach to removing corrugation once it occurs. “Smooth rail. Controlling the surface finish on the rail is the real key to having quiet track,” Moorhead said. The Bay Area Rapid Transit (BART) system began using acoustic data to identify locations that generate excessive noise, several years ago. Acoustic data is collected by microphones on the trailing ends of revenue trains and imported into CorrTracker®, a proprietary software utilized by ATS Consulting, BART’s acoustics consultant, to identify maintenance priorities based on decibel levels. The onboard acoustic system measures noise levels, tri-axial vibration, and speed (using a radar gun). The location information system identifies and syncs to RFID tags that are located at the ends of station platforms. The analysis software cleans up dropouts or faulty readings in the speed data and calculates the frequency spectrum of the noise and the vibration at 250-msec (1/8-second) intervals, and integrates the speed data to associate the vibration from each 250-msec interval with a specific mile post. “This approach worked well at BART in part because there were many locations on the system where rail corrugation resulted in noise levels that were 15 to 20 decibels higher than normal,” said ATS’s Hugh Saurenman. ATS developed easy-to-read three-dimensional displays of the noise data based on the sound level amplitudes and frequencies. BART encounters roaring corrugation, the biggest noise-related issues on the system, at frequencies between 400 and 600 Hertz, said Greg Shivy, BART’s principal track engineer – maintenance and engineering. Noise levels, along with complaints from passengers and nearby residents, increase in tunnels and aerial structures, and at speeds above 50 mph. Noise from corrugation is such that BART’s rail grinding program has been devoted to chasing it. As a result of its grinding program (and the recently completed migration from a cylindrical wheel shape to a conical BT3 wheel profile across the fleet), BART saw a 73 percent reduction in customer noise complaints, last year, Shivy said. While dominant, corrugation isn’t the only noise-related issue on BART. Battered joints, broken welds, or damaged frogs can also generate noise complaints. Residents along the right of way get accustomed to the rolling noise the trains make. A change can be a red flag. “If we get a complaint about noise in an area in which there were no previous complaints, we know that something has changed, and we need to look into it,” Shivy said. Using CorrTracker®, BART can go to the location identified in a complaint and play back the audio from the most recent run. (BART recently increased the number of acoustic runs from two to four per year.) By listening to the run, Shivy can discern whether the noise is related to corrugation or batter from a damaged joint, weld, or frog, or other track condition. CorrTracker also provides the ability to compare past and current acoustic measurement data, and the speeds at which they were recorded. Since there’s a difference in noise levels between data recorded at 40 mph versus data recorded at 75 mph, speed data, collected by a radar gun in the cab, is an essential component of the data. Wheel/rail noise and vibration was a known potential issue at Sound Transit during the design stage. To address noise- and vibration-related concerns, the track design incorporated a direct fixation system, using e-clips on Cologne egg-shaped fasteners, which provide up to a 10-dB reduction in noise and vibration. While the system provided the expected attenuation, e-clips began breaking at a rate of about a dozen per month within six months of opening the University Link section of the line, an extremely noise- and vibration-sensitive portion of the system because of its proximity to the University of Washington research facilities. “We could understand one or two clips failing per month, but 12 to 13 was concerning,” said Shankar Rajaram, Noise and Vibration Program Manager at Sound Transit in 2018. One of the early explanations for the premature fatigue failure was that the clips might have been weakened from overdriving during the installation, thus initiating a weak spot for crack initiation. This and other potential causes were examined to explain the premature clip breaks. It was apparent that the failure was due to fatigue, but it wasn’t clear what was causing it, especially since the clip failures were concentrated in a few areas, while there were no clip failures in other areas with similar track design and operating conditions. Aware of the noise-related assessment that was being done at BART, Sound Transit decided to take a close look at noise and vibration conditions. An onboard noise database that contained periodic noise data collected proactively on Sound Transit tracks showed unusually high noise levels (in the 800 Hz frequency range) in the clip failure areas. Led by this information, consultants instrumented the clips and fasteners and was able to determine that the noise on the system was coming from the track at a frequency of 890 Hz, which corresponded to the natural frequency of the e-clips. “It appeared that resonance of the track system was likely subjecting the clips to strains that exceed their design limit,” Rajaram said. Working with Pandrol and acoustic consultants, Sound Transit switched to a larger clip that shifted the frequency to above 900 Hertz and out of the track resonance. There were no failures within a 3,000-foot section over nine months. That was good news, Rajaram said, but it did not address the root cause. To further the investigation, Sound Transit strain gauged the track to determine whether track geometry or poor-performing trucks generated a coincidence effect that might contribute energy into the system and the 800- to 900-Hz resonance that appeared to cause the e-clip failure. Along with this effort, Sound Transit was proactively working to improve the finish quality of its grinding program. Corrugation data that ATS Consulting had collected at BART and Sound Transit showed a typical 30-mm (1.18-inch) peak in the rail roughness wavelength that was related to noise issues. Research done in Australia indicated that this 30-mm peak was related to the typical 3600 rpm speed of the grinding motors on rail grinders. A visual inspection of the track at Sound Transit led to an “aha!” moment, when inspectors identified unusually deep grinding marks at 1.1- to 1.2-inch intervals wherever a clip failure had occurred. While not completely proven, it appears that under train traffic, the deeper grinding marks at 30-mm intervals can input enough energy into the system to push the e-clip beyond its design limit, Rajaram said. As a result of its efforts, Sound Transit has developed a rail grinding specification to fix the root cause of the problem. The new grinding specification is less stringent than the ISO 3095: 2005 grinding specification but has substantially more stringent requirements for the final surface finish than the EN 13231-3:2012 specification, which North American grinders typically use. Sound Transit’s new rail grinding specification breaks down grinding into two distinct steps; (1) the grinding step that would involve heavy metal removal to shape the rail profile and/or remove surface defects, and (2) the polishing step to ensure a smooth rail finish. 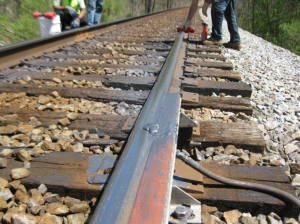 Advanced Rail Management performed the rail grinding in the clip failure area during the winter of 2018. The two grinding steps were accomplished using custom grinding stones, grinding pressures and speeds for the two different steps, following the guidance in Sound Transit’s specification. This allowed reducing periodic rail roughness peaks by more than 15 decibels compared to the roughness peaks seen in the areas of clip breaks before the new grinding program. There is already favorable empirical data in the form of a trend toward a reduced number of broken clips following the most recent grind, Rajaram said. In the coming months, Sound Transit plans to further evaluate the effectiveness of grinding in relation to reducing clip breaks. The testing plan includes instrumenting the clip/fastener with vibration transducers and repeating the train measurements at locations that were tested before grinding. 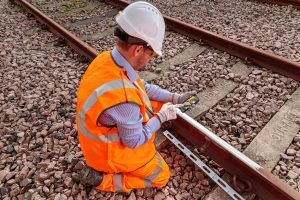 The testing will collect data for the larger clips and later for e-clips with the goal of verifying whether the new rail grinding finish has helped to reduce the clip strains to levels within the design limit during fully loaded train passbys. Sound Transit also plans to monitor the performance of the clips over a period of 8 to 10 months and use the data to inform the selection of appropriate rail clips for future projects. The APTA Track and Noise/Vibration Technical Forum is to represent rail industry members in the technical review of track, system noise and vibration issues and concerns, to collect, evaluate and publish current practices and to recommend research and best practice guidelines. The member forum is comprised of agency representatives, rail product manufactures and Noise and Vibration Engineering consultants. The forum meets biannually (spring and fall) to tour rail transit agencies and review their ongoing noise and vibration mitigation efforts. Meetings are usually two days in length. They include a tour of the operations and noise/vibration issue areas, a presentation by the host agency outlining the noise and vibration issues, mitigation measures and results. Additional presentations from industry experts on new projects, products and services that are relevant to the Noise and Vibration forum members are also included. Click here for information on the APTA Noise & Vibration Technical Forum.